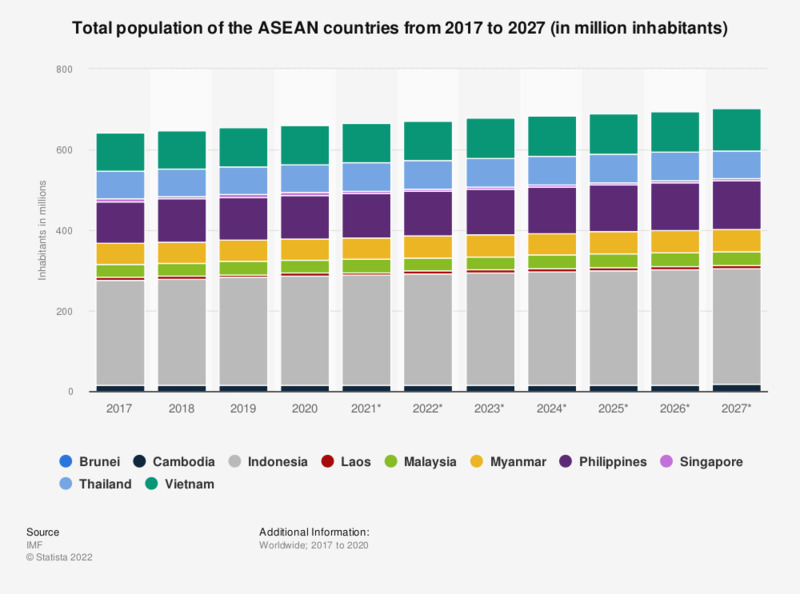 This statistic shows the total population of the ASEAN countries from 2008 to 2018. The ASEAN (Association of Southeast Asian Nations) member countries are Brunei, Cambodia, Indonesia, Laos, Malaysia, Myanmar, Philippines, Singapore, Thailand, and Vietnam. In 2016, the total population of all ASEAN states amounted to an estimated 635.9 million inhabitants. *Indonesia, Laos, Malaysia, Philippines, Singapore: Figures after 2016 are estimates. Brunei, Myanmar, Thailand, Vietnam: Figures after 2015 are estimates. Cambodia: Figures after 2012 are estimates. Everything On "Thailand" in One Document: Edited and Divided into Handy Chapters. Including Detailed References.